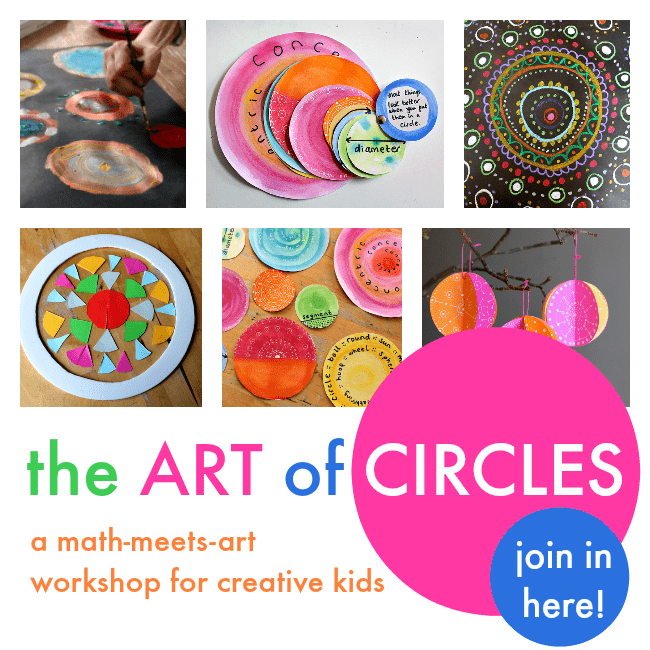 Circle math games :: making maths fun! 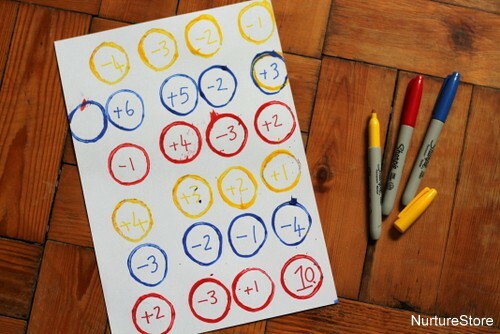 These circle math games add a little fun to practising basic math facts. Here’s how to make your own DIY game. 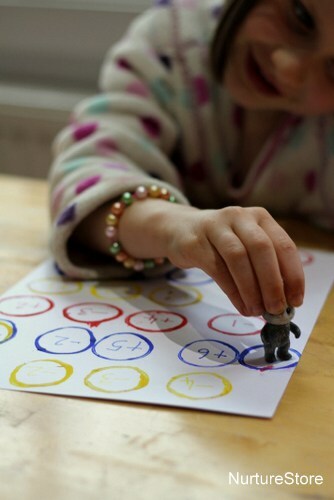 The math facts of addition and subtraction are the basic building blocks at the heart of so much later mathematics. If you can learn them so you have a really quick recall of them, and a fundamental understanding of them, lots of the later, more complex, math work we do is instantly made easier. But memorising can be boring! 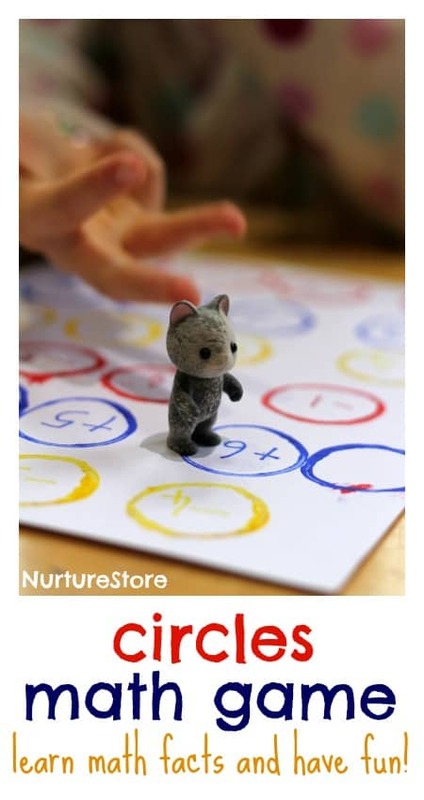 Here’s an idea for adding in some fun, while still getting lots of practice at learning those math facts. We’re going circle hopping! 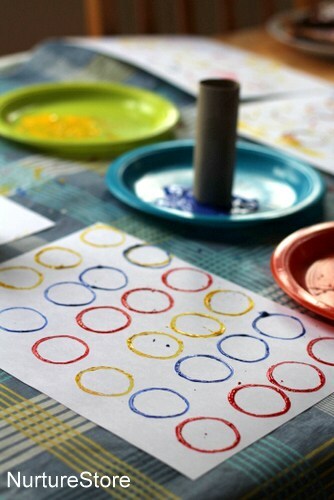 We’d been exploring circles by doing some printing (there’s a Math and Art series on the way) and one of the artworks we’d made was this one, with a grid of coloured circles. Once the paint was dry, I used a permanent marker to write in some of the math facts my daughter is working on at the moment. You can adapt this to suit the right stage for you own child – see the suggestions below. 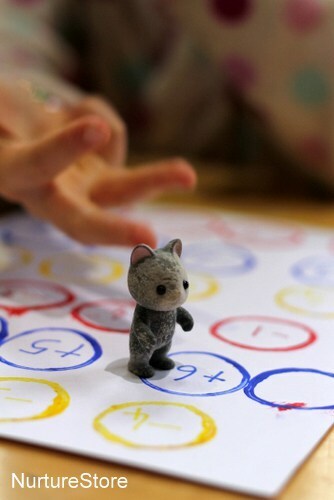 Then pick your favourite little character, who’s going to jump around the board for you as you answer the questions they land on. Meet Fluff. We started with the number 10, so wherever we jumped to first I knew we’d be able to make a sum that didn’t land us in negative numbers. Then Fluff jumped around and my daughter worked out the answers for each step. 10+4 = 14. So then 14 – 2 = 12. So then 12 +3 = 15, and so on. Both Fluff and my daughter had fun! – write in some numbers and see if you can always jump to a bigger number: jump from 1, to 4, to 23, to 54, to 67…. Ooooh using Sylvainians as counters is genius! That might just get my girls excited about maths!